Long after the pitter patter of little feet dissipated, signaling the end of art class, Veda Baker, a first grader from Virginia Peterson Elementary School in Paso Robles, diligently continued working on her crayon and watercolor painting of a crab one rainy Friday morning in April at Studios on the Park. “I like it because it makes me happy to do art,” Baker said. FIELD TRIP: Eve Chatrand works with Leslie Ortiz, right, and Ashton Mayfield, left, from Virginia Peterson Elementary School, during a field trip to Studios on the Park in Paso Robles. Baker and her classmates from Jill Goldbach’s mixed kindergarten/first grade class took art class (free of charge) as part of the gallery’s Kids Art Smart program. Leslie Moss, volunteer coordinator for the program, said it was originally launched in 2011, when school budgets were slashed and art classes cut because of the recession. 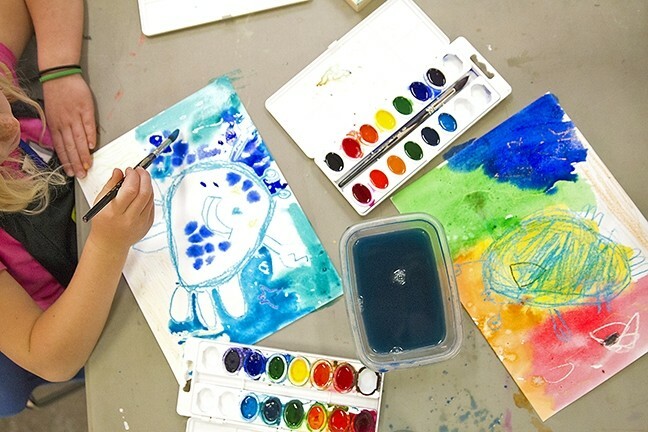 Since its inception, more than 6,000 kindergarten through sixth-grade students from North County schools—including Paso Robles, Shandon, Atascadero, Templeton, Pleasant Valley, and San Miguel—have received art lessons from a team of eight local, professional artists. 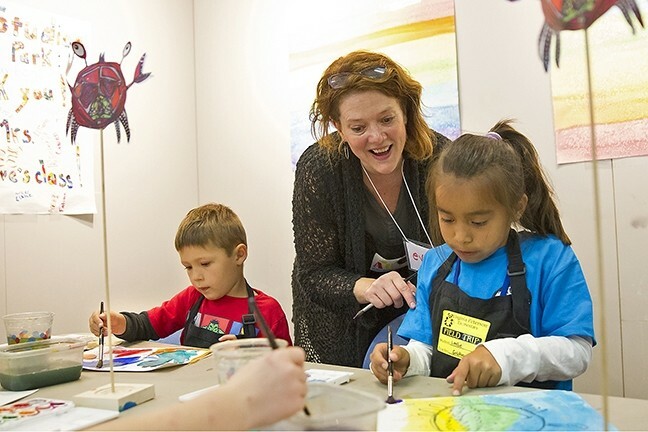 While art is penciled back into local school budgets, Kids Art Smart remains a supplement to everyday art education. Studios on the Park is able to offer the program at no cost to schools through grants and sponsorships. Every school day during the fall and spring, little hands create in the studio’s classroom (schools can expect to have classes come for a visit every few years). This spring, more than 2,000 students will participate in the program and have their work displayed on-site in an exhibit. UNDER THE SEA: Kindergarten and first-grade students from Virginia Peterson Elementary School in Paso Robles spent a Friday morning learning to paint a crab as part of the Kids Art Smart program at Studios on the Park. “Getting to come to school at a working studio and see art on display is a bit of a different experience,” Moss said. For Goldbach’s group of young art aficionados, the two-hour ocean-themed visit to the studio was broken up into time for art activities, a story, snack time, and even a dance break to songs from The Little Mermaid soundtrack, all led by local artist Eve Chatrand. Each grade focuses on a different art form, such as watercolor, collage, ceramics, printmaking, and even plein air painting at Hearst Castle for the sixth graders. Goldbach, who’s brought multiple classes to the gallery over the years, said the experience allows students who may struggle with behavior or language to finally feel successful in another arena. ARTIST IN TRAINING: Veda Baker, a first grader at Virginia Peterson Elementary School in Paso Robles, takes her time painting the ocean backdrop of her crab painting at an art class at Studios on the Park. Ryah Cooley is down for art class, snacks, and naptime at rcooley@newtimesslo.com. GET SCHOOLED: Interested in sponsoring a student to get free art education at Studios on the Park? It costs $32.06 to sponsor one student and $917.41 to sponsor an entire class. 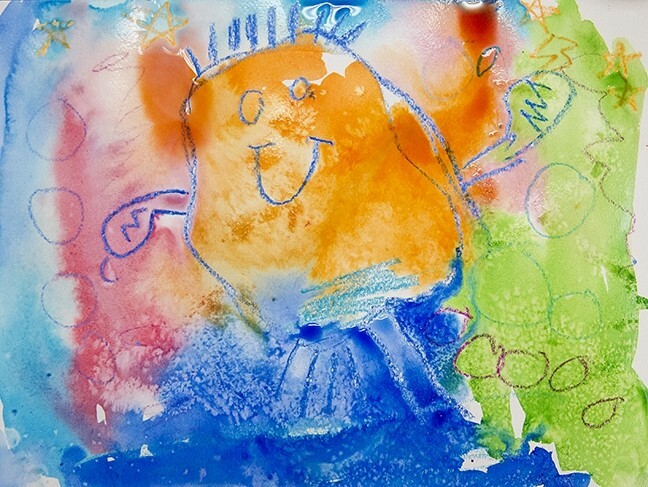 The art made by students from Templeton and Vineyard Elementary Schools through the Kids Art Smart program will be on display at the gallery April 27 through 30, and the art from students at Virginia Peterson and Monterey Road Elementary Schools will show May 4 to 7. For more information, visit studiosonthepark.org.